This wall shelf is a great way to try out the technique cf cutting dove tails on a band saw. (Ftr a full explanation cf this technique, see pages 18 to 23,) The four sides cf the shelf, as well as the drawers, are all joined with through dovetails. A word about dovetails. Dovetail joinery is an age-old technique. Yet, it seems right at home on contemporary furniture, especially those pieces with very simple lines that allow the dovetails to be accented. That's why this shelf is an ideal candidate for dovetails. The joinery provides a nice touch of decoration — and it's a subtle way to show off your craftsmanship. THE DRAWERS. I also used through dovetails to make the three drawers that fit in this shelf. However, with the drawers closed, what you see on the front of the drawer doesn't look like a dovetail — it looks more like a boxjoint (see photo above). You have to open the drawer to see the characteristicdovetail shape on the drawer's sides. hanging system. Besides dovetails, this shelf offers another interesting challenge—hanging it on the wall once it's done. Of course, if you use screws or any type cf anchor devices, you'll want to drive them securely into the wall studs. Not an easy task. Even if you can locate the studs, there's only a slim chance they'll be in the right location for hangingthe shelf. 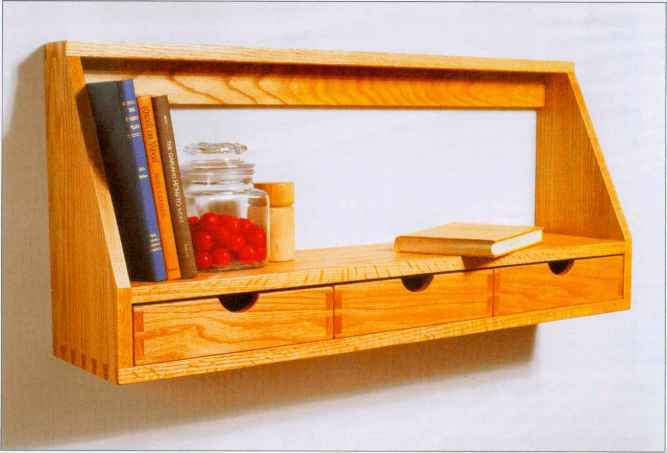 wood and finish, Hie shelf shown in the photo above was made from red oak and finished with two coats of an eggshell (matte) varnish. The combination cf oak and a matte finish enhances its contemporary look.